How we flow with change makes a huge difference in our lives. Play the game instead of feeling the stress of change. 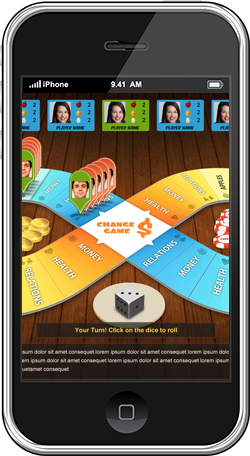 The Change Game™ is an exciting and educational online board game by business success coach Ana Weber that is both challenging and fun to play. It rewards up to 4 players for solving real life situations while retaining elements of chance. Players encounter life situations while traversing the board with their game pieces. They are rewarded for solving these situations using tips based on the Apples-Eggs-Onions formulas from the book, 360 Degree of Success. If you want to lose weight – play the Change $ Game! You are looking to make more money – play the Change $ Game! You want to reach a happier place in your life – play the Change $ Game! You want to feel more energetic– play the Change $ Game! You want to have more time – play the Change $ Game!